Rabelais and His World (1965) is a book by Russian scholar Mikhail Bakhtin. 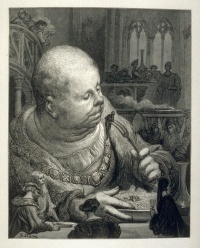 A classic of Renaissance historiography, the study explores Gargantua and Pantagruel of the French Renaissance writer François Rabelais. The key concepts are the carnivalesque and the grotesque body, seeing the latter especially as an agent of a number of processes characterized by the prefix re-: renewal, rebirth, regeneration, reconstruction, revitalization and ultimately Renaissance. Bakhtin submitted a dissertation on Rabelais in 1940 to receive his Candidate of Sciences degree. Some members of the committee, including Boris Tomashevsky were favor of awarding Bakhtin a higher degree, Doctor of Sciences. However, because the tumults of World War II, the thesis defense took place after the war between 1946 and 1949, and since the controversial ideas discussed within the work caused disagreement, VAK decided Bakhtin receives (only) Candidate of Sciences degree. Rabelais and Folk Culture of the Middle Ages and Renaissance was published in a rewritten form in 1965, at which time it was given the title, Rabelais and His World. The Indiana University Press English translation by Hélène Iswolsky has The Fat Kitchen by Pieter Bruegel on its cover. This classic work by the Russian philosopher and literary theorist Mikhail Bakhtin (1895—1975) examines popular humor and folk culture in the Middle Ages and the Renaissance, especially the world of carnival, as depicted in the novels of François Rabelais. 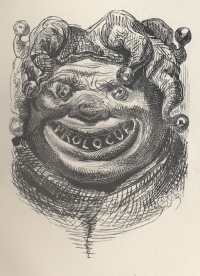 In Bakhtin's view, the spirit of laughter and irreverence prevailing at carnival time is the dominant quality of Rabelais's art. The work of both Rabelais and Bakhtin springs from an age of revolution, and each reflects a particularly open sense of the literary text. For both, carnival, with its emphasis on the earthly and the grotesque, signified the symbolic destruction of authority and official culture and the assertion of popular renewal. Bakhtin evokes carnival as a special, creative life form, with its own space and time. Written in the Soviet Union in the 1930s at the height of the Stalin era but published there for the first time only in 1965, Bakhtin's book is both a major contribution to the poetics of the novel and a subtle condemnation of the degeneration of the Russian revolution into Stalinist orthodoxy. One of the essential texts of a theorist who is rapidly becoming a major reference in contemporary thought, Rabelais and His World is essential reading for anyone interested in problems of language and text and in cultural interpretation. Based on the 1968 edition, tr. Hélène Iswolsky, Rabelais translations by Jacques LeClercq. The manifestations of this folk culture can be divided into three distinct forms. 1. Ritual spectacles: carnival pageants, comic shows of the market-place. 2. Comic verbal compositions: parodies both oral and written, in Latin and in the vernacular. 3. Various genres of billingsgate: curses, oaths, popular blazons. These three forms of folk humor, reflecting in spite of their variety a single humorous aspect of the world, are closely linked and interwoven in many ways. "In fact, carnival does not know footlights, in the sense that it does not acknowledge any distinction between actors and spectators.... Carnival is not a spectacle seen by the people; they live in it." For Bakhtin, carnival is associated with the collectivity. Those attending a carnival do not merely constitute a crowd; rather the people are seen as a whole, organized in a way that defies socioeconomic and political organization. According to Bakhtin, “[A]ll were considered equal during carnival. Here, in the town square, a special form of free and familiar contact reigned among people who were usually divided by the barriers of caste, property, profession, and age” (p. 10). The carnival atmosphere holds the lower strata of life most important, as opposed to higher functions (thought, speech, soul). At carnival time, the unique sense of time and space causes individuals to feel they are a part of the collectivity, at which point they cease to be themselves. It is at this point that, through costume and mask, an individual exchanges bodies and is renewed. At the same time there arises a heightened awareness of one’s sensual, material, bodily unity and community. Bakhtin opens this work with a quotation from Alexander Herzen: "It would be extremely interesting to write the history of laughter". One of the primary expressions of the ancient world's conceptions of laughter are the apocryphal letters of Hippocrates about Democritus. The laughter of Democritus had a philosophical character, being directed at the life of man and at all the vain fears and hopes related to the gods and to life after death. Democritus here made of his laughter a complete conception of the world, a certain spiritual premise of the man who has attained maturity and has awakened. Hippocrates finally perfectly agreed with him. Time is a playing boy who moves the draughts. Unless indicated otherwise, the text in this article is either based on Wikipedia article "Rabelais and His World" or another language Wikipedia page thereof used under the terms of the GNU Free Documentation License; or on original research by Jahsonic and friends. See Art and Popular Culture's copyright notice. This page was last modified 16:11, 9 March 2019.